For me, APIs have been probably the most interesting area of Web development over the past few years, allowing modestly resourced (and perhaps modestly talented) developers to tap into bigger, richer systems than they could ever hope to create themselves. Looking at site like FD’s Flickr Toys it’s tempting to conclude that the Flickr API has been the most widely used, but that might be selling the APIs from Del.icio.us, Amazon, eBay and, of course, Google short. The result has been hundreds of new and interesting products, services and miscellaneous mashups that would otherwise never have been. Some have been deeply practical — X-Moments and HousingMaps comes to mind — while others have been focusing on being clever and fun. 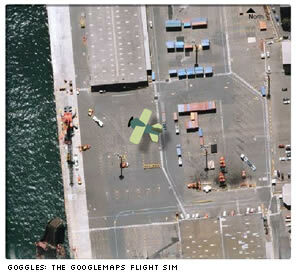 Like this one: Goggles :: The Google Maps flight sim. So, next time you grab a coffee, load it up, choose a city, pull on a set of flying goggles and take to the skies over any of the great cities of the world — from London to New York to Zurich to Sydney. You can even choose your own if you’ve got the patience. The basic app is simple but addictive, using Flash to overlay a series of simplified 3D renderings of a plane over a smoothly scrolling map feed. Along with the basic directional controls, Goggles even gives you machine guns, allowing you to strafe your least-favorite city. Fun for all the family there. I actually found it was a surprisingly entertaining way to use the maps. The constantly passing parade of maps keeps things interesting, although a ‘Freeze’ button might be nice for when you find something cool. Nevertheless it’s a great idea nicely executed. So, does it actually use the API? Well, technically not,… but ‘shhh’.. why be picky when it’s so much fun buzzing the mansions on Sydney Harbour?